An unidentified person climbs onto the hood of their car to avoid the high water along Jackson Pike early Tuesday morning. Rescue workers were able to get to the individual. 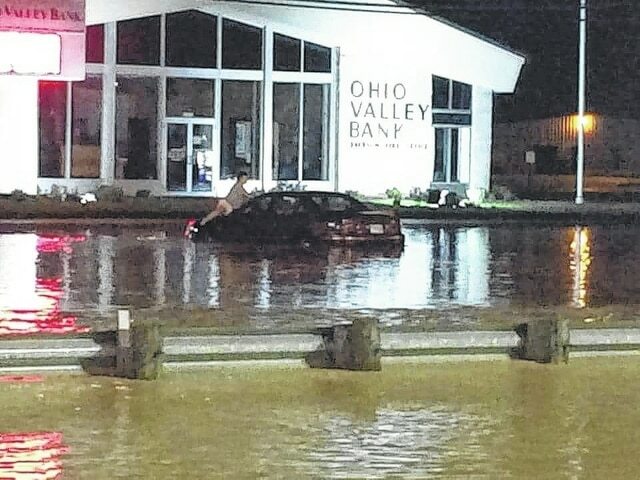 GALLIPOLIS — Due to major thunderstorms early this week, Gallia County residents have contended with a variety of problems including flooded roads, bridge collapses, submerged homes and power outages. Rain, wind, lighting and thunder have played roles in both impressive chain lightning displays and dreaded flash floods over the last 48 hours. According to Sherry Daines, director of Gallia County EMS and the local Emergency Management Agency, and Tim Miller, deputy director of Gallia County EMA, the distress calls began at about 2:30 a.m. Tuesday. High-water rescues were made on State Route 775, Little Bullskin Road and Mount Tabor Road in Gallia County. Miller said Gallia County fire departments have four districts with boats for rescue operations. Mason County, W.Va., personnel helped Gallia County rescue responders. Daines said the American Red Cross will often assist with shelter for people who suffer home loss or temporary displacement, although it is more common for those people to stay with relatives. Miller said 10 rescues were enacted Tuesday morning; two of the households were assisted by Red Cross with shelter needs. Daines said Ohio Valley residents must pay attention to local news and social media weather reports. Gallia EMA and EMS officials say they constantly attempt to distribute up-to-date information to assist people in potential danger. Local emergency personnel use Everbridge, an alert system that delivers messages to cell phones and landlines. Individuals must sign up for cell service, but landlines will be contacted automatically. “People need to pay close attention to their surroundings (when flooding), especially if you live by a creek or a stream,” Daines said. Both Daines and Miller said the area has received an abnormally large amount of rain since Monday. “People just need to be a little bit more vigilant,” Miller said. According to Gallia County Engineer Brett Boothe, various county roads and township roads have been closed. Numerous culverts and bridges have been knocked out. Hannan Trace Road has been closed; Lincoln Pike culvert, measuring a 15-foot span, has failed; Johnson Road has been closed; Barcus Hollow bridge has been washed out; and the bridge has been closed on Williams Hollow Road. Also, Lewis Road’s bridges have suffered damage and a washed out culvert while a bridge collapsed on Little Bullskin Road and a culvert washed out on Cargo Road. Boothe said the engineer’s office had to bring out snow plows to scrape sedimentation off roads to make them passable, as well as drop material for drivers to maintain traction. He added that the recent rain has done some of the most extensive storm damage he has ever seen.